This Air-Pro Arched Raised Panel Wall Mount Range Hood features a distinct arched valance. The high-end style and quality of this range hood make it the perfect addition to any kitchen. 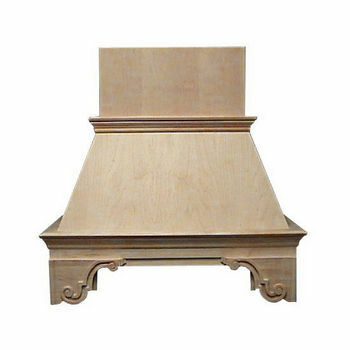 The hood is constructed from any of three different quality hardwoods including Red Oak, Maple, Hickory and Cherry. The woods are unfinished so your range hood can be painted or stained to match your kitchen cabinets or range. This range hood is available in 30", 36", 42” and 48” widths to accommodate most range sizes. Re-circulating ductwork kits are also available. This has exceeded our expectations! It is absolutely beautiful. It is made like a fine piece of furniture and we can't wait to see it installed and finished. It's rare these days to find a mfg. Yes, the chimney is trimmable. If you are not comfortable trimming it yourself, we can also request a custom quote for you; but we would need to know the exact dimensions that you need the hood to be. All Air-Pro wood hoods come unfinished, that way you would have the option to either paint or stain the hood to match your existing kitchen. Yes, to place your custom order call us directly at 800-667-8721!